...Set: Supernatural 6x06 "You Can't Handle the Truth"
In an episode about revelations, I think the most horrific one of all has to be the fact that Bobby watches Tori and Dean. Perish the thought! Who would even think that Bobby has cable? He totally seems like a rabbit ears kind of guy. But Bobby's terrible reality show secret was not the only one coming to light, as people all over some town were suddenly having the terrible truth dealt to them, which lead them in turn to kill themselves. The string of suicides brings the Winchesters around to investigate, but they don't figure things out before probably one of my worst nightmares comes true - a dentist drilling some dude to death! AAAHHH!!! I am not a fan of the dentist. So... no. Just no. While Sam is very much into the case and doing the job, Dean is thoroughly distracted by his misgivings about Sam. As you'll remember from last week, Dean saw how Sam just stood there and watched him get turned by the vampire. Dean hasn't brought it up with Sam since then, but he is thoroughly convinced that Sam is not his brother. He calls up Bobby to see if he can figure out anything, but Bobby has found exactly bupkis on the subject. We even get a brief visit from Castiel to reaffirm the fact that no one knows what is wrong with Sam. Dean's like thanks for all of the non-help, friends, and takes another shot of whiskey. I think it's whiskey that he's always drinking, right? And that's when he says the magic words that went something along the lines of "I want the freaking truth." And voila! Suddenly people are spilling their guts, whether it's about their fake breasts, or Bobby's aforementioned confession about watching Tori and Dean, and other sordid little things I'm sure our Dean never wanted to know. Sadly, though, this truth stuff also leads to what appears to be the big break up of Dean and Lisa, since she calls and is forced to tell the truth about how she feels about their whole situation. The truth? She hurts. She hurts bad. Lisa says they're dunzo. Sam, meanwhile, has found out who was the first one to die from whatever this truth thing is, and has Dean meet him at the dead lass's apartment. Before they can investigate further, however, Dean would like to ask Sam a few questions, since he should have to tell him the truth. Right? Well. When Dean confronts him about why he didn't stop the vampire thing, Sam claims that he just froze. LIE. And if he's lying, that means he's not affected by this truth business, so something is really, really wrong. Only Dean seems to believe him. For now, anyway. They find out that the girl who started this whole thing summoned a god by the name of Veritas. She infects people with the truth stuff, they eventually off themselves, and she takes their bodies as tribute. And who should this Veritas woman be? Why, the conveniently placed in the background newswoman Ashley Frank of "Frank Talk." They track her down and get ready to make with the killing, but she manages to get the better of them and ties them up. And that's when the real truth is forced to come out. She makes Dean confess not only that he hasn't been sure about Sam, but also that he knew it was never going to work out with Lisa, because deep down he's a killer, not a husband or a father. Sad. Veritas then turns her attention over to Sam, but guess what! Sam is able to straight up lie to her. But she can at least tell that he's lying, and as such claims he must not be human. She doesn't get to live too long with this knowledge, though, because Sam had surreptitiously been knifing his way out of his ropes. Battle, battle. Death to the Truth Lady. Also, her cat face? Totally freaky. Also freaky and just downright gross? When she ate that tongue. Ugh!! Nasty! So much nasty mouth stuff tonight! But then Dean turns his knife on Sam. He wants to know what's really going on. The actual truth, now, please! And, FINALLY, Sam actually tells him. Or at least, tells him that he knows something is wrong, but that he doesn't know what. Ever since he's been back, he's been a better hunter, because he can't feel anything. His emotions just aren't there. 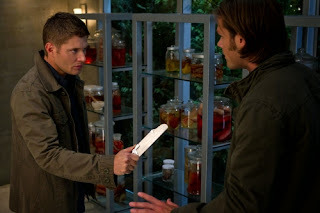 Dean sets down his knife, and Sam thinks it's all going to be hunky dory. BUT then Dean just full on starts beating the crap out of him until he's unconscious! Wow. Way to handle Sam asking you for help, Dean. YEESH. - I loved Lisa's call out of the weird relationship Dean and Sam have. So true. So many people have been saying it lately, too. - They were probably trying to be subtle with the news lady in the background being the clue, but it was just so blatant, particularly in the bar. It's sort of like "oh here you go! we wouldn't care what she was saying if she wasn't some sort of clue!" - How many times was the word "creepy" or some variation thereof used this episode? At least probably four. - Hello, preview! Give away much? The end of this episode left it a question as to what's wrong with Sam, but the preview basically just told us. I hate when they do that. I'd like a little snippet, not the whole shebang. But at least we're getting answers.